Mailpile is a modern, fast web-mail client with user-friendly encryption and privacy features. 100% Free and Open Source software. It’s free-as-in-freedom personal e-mail searching and indexing tool, largely inspired by Google’s popular proprietary-but-gratis e-mail service. 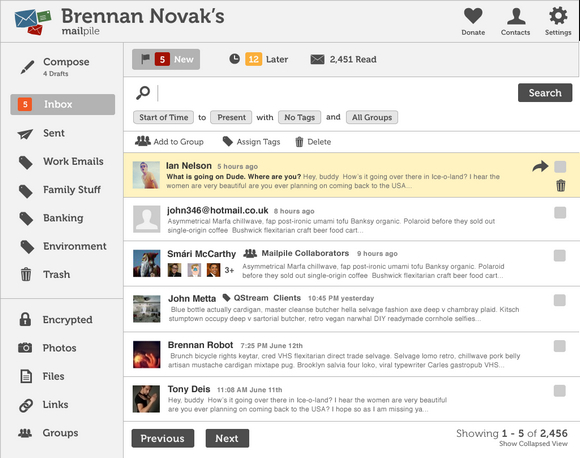 It wants to eventually become a fast and flexible back-end for awesome personal mail clients, including webmail. Mailpile is still experimental and isn’t actually very useful yet. It’ll tell you that you have mail matching a given search and let you sort it, browse threads and read messages… but the user interface and message composing/sending functionality is still very immature. If you just want a useful tool and aren’t interested in hacking on the code, you should probably check back later for updates.